Francisco Pizarro was born in Trujillo, Spain in 1474, the illegitimate son of a nobleman. 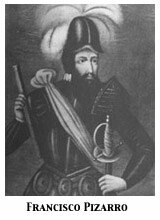 In 1519, Pizarro joined an expedition to settle Panama, where he gained a reputation as a valiant and successful soldier. He became a relatively wealthy middle-aged man, but when he heard rumors of a treasure-laden, indigenous civilization south of Panama, he began work on an expedition. His first expedition in 1524 was unsuccessful, but on their second trip in 1526, they found a raft filled with gold and jewels. The third expedition led Pizarro's army into the mainland of South America, eventually destroying the Inca civilization forever. Diego de Almagro was born in 1475, and eventually became one of Pizarro's original partners in his 1524 expedition. For the next ten years, Almagro was a loyal partner and fellow soldier with Pizarro as they conquered the Inca empire. For the most part, Almagro led a very difficult life. For example, he lost his eye in a small battle on their first expedition. Regardless, Almagro was famous for his toughness and brutality. Almagro quickly gained power by the hand of the King of Spain, and was instructed to lead a new expedition in present-day Chile. After finding nothing, He led his group back to Cuzco where he had been living, only to begin a war with Pizarro. Almagro's army was defeated, and he was executed in July of 1538. Born in 1479, Sebastian joined Christopher Columbus on his third voyage at the young age of 19. After spending several years serving in Nicaragua, he joined Pizarro in 1532 in his conquest of Peru. He rose through the ranks as a governor of the Popayan province after returning from Spain in 1541. Benalcazar also organized several unauthorized expeditions into modern-day Colombia, only to eventually flee to avoid being arrested by Pizarro's men who had become suspect of his actions. He aided groups of people against the rule of de Almagro and Gonzalo Pizarro, something he was eventually tried and convicted of. Benalcazar died of fever shortly after being convicted.